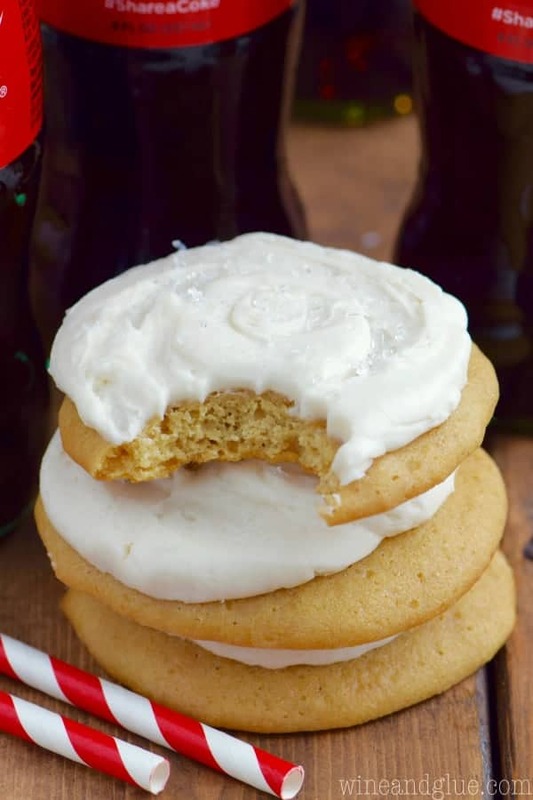 Perfect sugar cookies that will be everything you want it to be! Buttery, delicious, and addictive! 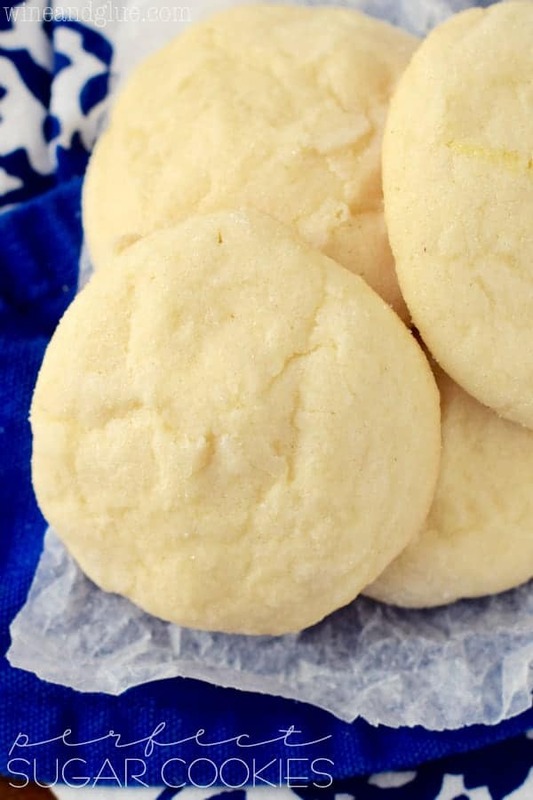 This soft sugar cookie recipe is going to become your new favorite cookie recipe! They are chewy, buttery, and tasty. They have the perfect crisp outside and the best soft center. Not only that, but they are easy to spin off into other great cookie recipes. 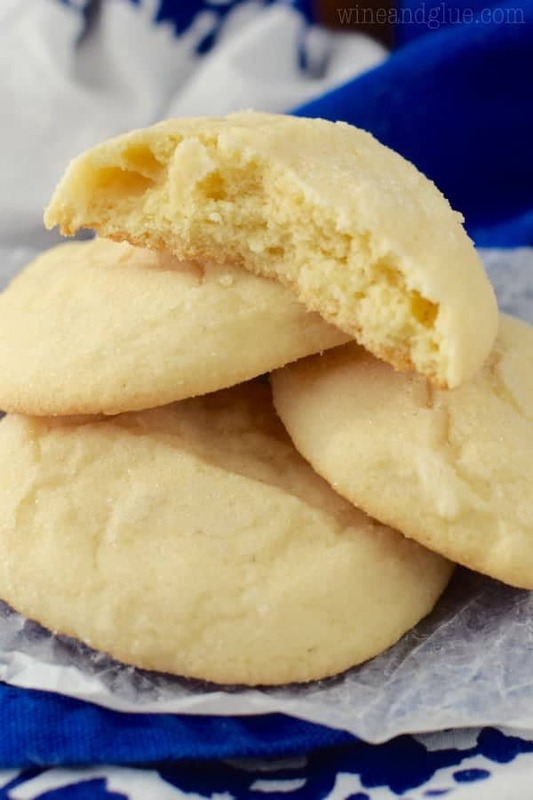 These lemon sugar cookies and pumpkin sugar cookies come from this recipe. Not only that, but they make the best cookie bars like in these caramel apple bars. And they would be great with this vanilla buttercream frosting on top. So this is the very first recipe that I’ve attempted to make and then photograph since having Piper. Ummm . . . . this is a whole new ball game. Holy difficult! And my sleep deprived baby brain has completely forgotten how to take and style pictures. Not to mention that in the month since I have had her, the lighting in my house has COMPLETELY changed. Trees that were fairly bare, are suddenly totally filled in, and the time and place that photos used to work in my house . . . just doesn’t any more. Enough of my sad story. These cookies are so amazing in fact, that they are the main ingredient for another recipe coming your way soon. Roll the dough into one inch sized balls. 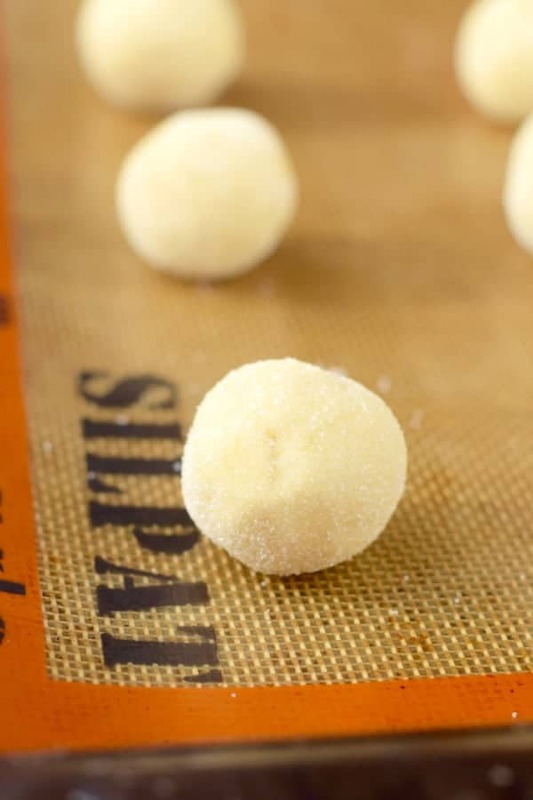 (Optional: Roll in sugar) Place on a parchment lined baking sheet or silicon mat and press down slightly. Space the cookies about two inches apart. These Peanut Butter Jelly Sandwich Cookies smell like childhood! 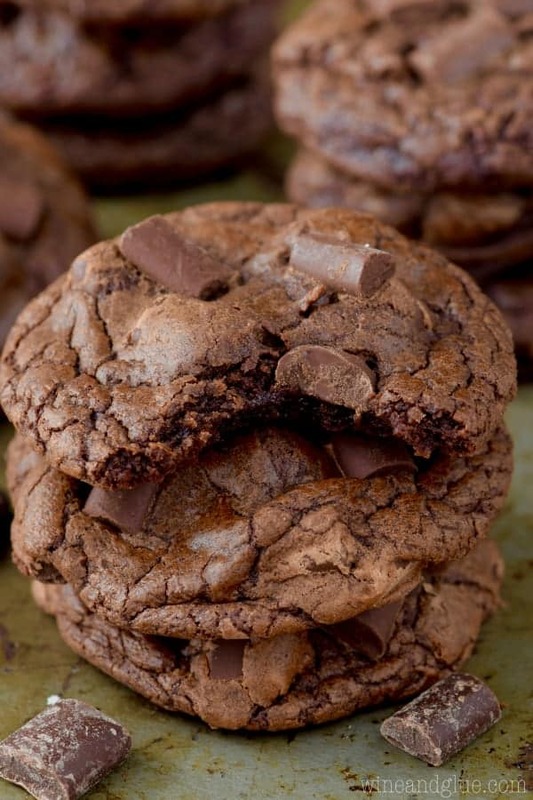 Chocolate lovers need these Double Chocolate Cookies! And this Skillet Cookie is a cookie for one, yes? I can’t even imagine. And I’m sitting here worrying about summer. I’ll stop complaining now, lol. 🙂 Love these, I want 6 RIGHT NOW. Sugar cookie dough is amazing. And I am glad we both know it doesn’t count!! Can’t wait to see what you use these cookies for next! Hey, it’s hard to brush your teeth when you have a baby, let alone make cookies! And these are far more perfect than cookies most people make when they don’t have fifty thousand hours of sleep deprivation working against them. Lisa – These look so soft and yummy! I would love for you to link them up on Sunday at Happiness Is Homemade Link Party! Have a terrific weekend! I’m always looking for the best cookies recipes, and my family are fanatics about sugar cookies. I can’t wait to try these! Looks good 🙂 I would love it if you joined and contribute your awesome posts at my link party at City of Creative Dreams, starts on Fridays 😀 Hope to see you there at City of Creative Dreams Link Party. Made these for a bake sale. They were great! Not overly sweet. Crispy and soft (yes really!). They survived being baked the night before, packaged into bags for the next day. I might add a flavoring for the next time. Maybe lemon? I’m so glad you liked them Emily! If you add flavor to them, come back and let me know how they go! These cookies are awesome! We loved them. Do they hold their shape well if using cutters ? how many cookies does this recipe make? They look good! Since I am just now seeing this, I would like to know which recipe you used with these as an ingredient. 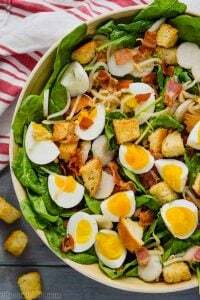 I will be making these tomorrow morning. Hmmm….lemon sounds like a fine idea. I have an abundance right now. Are these good for cut out sugar cookies? do they spread? and how thick can you make them? Can you freeze and bake later? 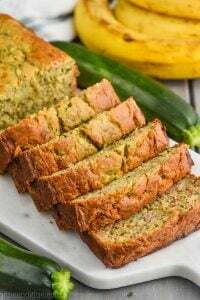 Do you need to change anything for baking time or temperature? Hey well I made the recipe as directed butmy dough came out gooey. Where did I go wrong? Was the butter supposed to be melted? Oh no! I’m sorry this didn’t work for you! Yeah, the temperature of the butter can make a huge difference in the recipe. The butter should be room temperature. In other words you should be able to push your finger into it easily but not all the way through. I usually accomplish this by cutting up my butter into one inch pieces and leaving it on the counter for a half hour before I need it. Holy *curse word* I’ve tried so many recipes for sugar cookies and tonight I made these. I will never use another recipe again. They aren’t even completely cooled and my husband has had 3! Thank you for sharing! Hahahaha! This was such an awesome comment, Leslie! Lol! Thank you! I just got this recipe like a month or so ago, and we have already used it 3-4 times! I love these cookies!! They are absolutely amazing!!!! <3 Thank you thank you!! So glad you liked it Caitlin! Thank you for letting me know! They taste amazing! Baked for 9 minutes/ didn’t rotate. 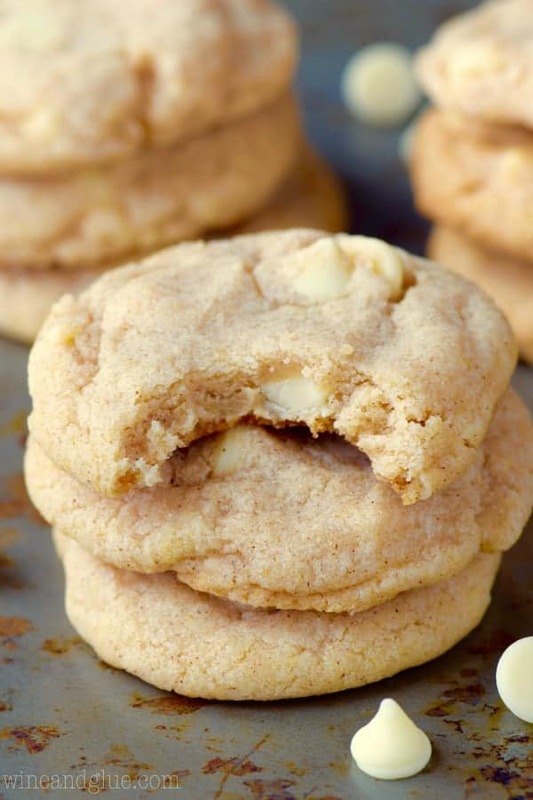 Slightly soft gooey middle with a great sugar cookie flavor. I’m so glad you liked them Danielle! These cookies look amazing! 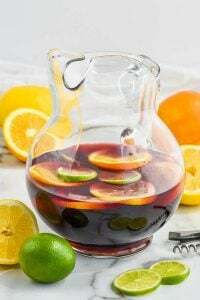 Haven’t made these yet but looking forward to making them! I hope you like them Caroline! They are some of our favorites! I’m so sorry that this didn’t work for you. Are you at a high elevation by any chance? That would really affect the cooking temperature and length of time it needs to be in the oven. WOW! 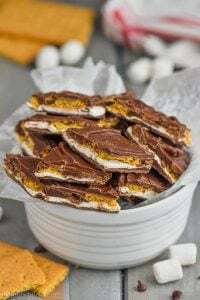 These were so quick and easy to make! They were soft and seemed to just melt in my mouth! Thanks for the recipe! So glad you liked them Stephanie! My family is NUTS about this recipe. Every time I make them they say they are the best cookies they’ve EVER had. Thank you for this post! I’m so glad they like them, Carey! Hi, so I’m trying these tomorrow and I was wondering do you think I should let the dough sit in the fridge before baking? Thank you. Hello. As a new baker (just moved from the big city in FL to a small town in NC) i’m a single mom and i love our time baking bonding together. But our last attempt reminded me of some premix cookies in a bag . TUCK! 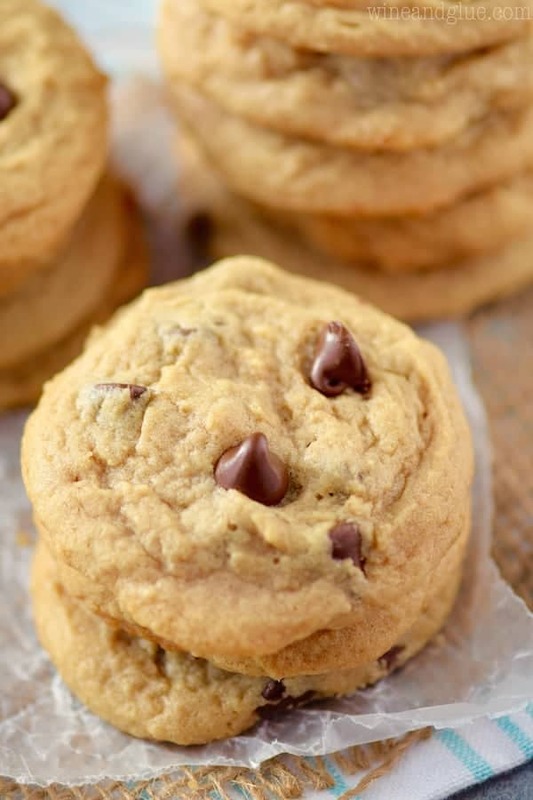 i love thick soft almost underdone cookies so we will tr this recipe now Today! I am curious when rolling the dough in sugar before baking does it melt off or make the cookie crunchy with sugar? I am very new to baking my mom never did it ever so that may be why i’m so intrigued with it for my daughter and i. So any tips will be greatly appreciated THANKS!!! It makes it crunchy 🙂 You can totally skip that step if that doesn’t appeal to you. Happy baking! I’m so glad you liked them! The key to this recipe is butter that you can push a finger into and just dent it, but not push all the way through. 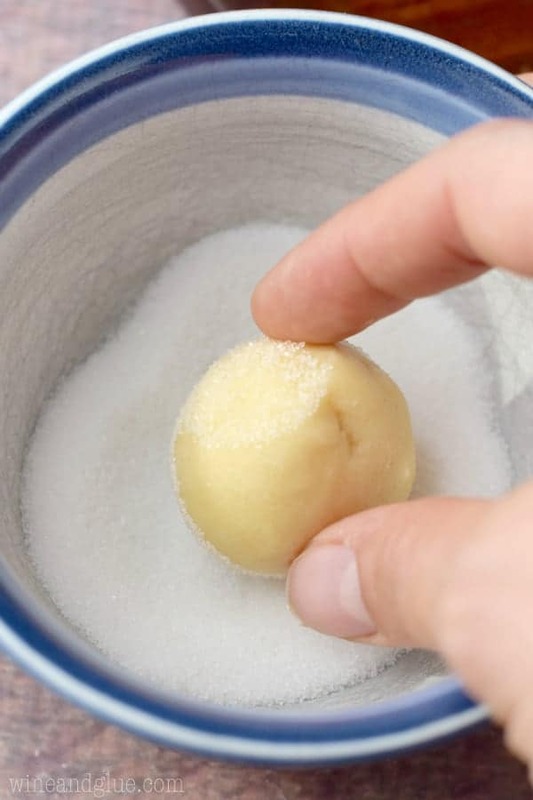 So I noticed the sugar is a cup and a half – do you mix it all in or is part of it to roll the cookie in? I’ve made this very recipe exactly as is written using red, pink, blue, etc. sugar and they’re absolutely adorable. Does Anyone know if I can freeze them with the sugar on? I’m so glad it worked so well for you! These are the best cookies in the world! I always mess my cookies up, but this time they were perfect 🙂 Thank you!